​‘Now’ is such a very small window of time, a moment, a second, a single breath. By the time we exhale into the now, the moment we inhaled is a then. And that is just how quick our plans and dreams of tomorrow can turn into dust. We live within this self-created illusion that we are in control, that we can plan and orchestrate and manipulate and order everything just the way we like. Maybe it works for a time; but then there’s that moment. That uncontrolled moment that occurs in the middle of our big plan. That moment when we inhale from one world and exhale into another. ​My knees gave way and somehow I landed on the bed. The implosion shook me to the core, although I knew the neighbors heard nothing, felt nothing. They didn’t know, couldn’t see... how could they hear the sound of my family’s life imploding? For a long time after, I searched for the right word to describe what happened, implode, that was it. You’ve probably watched video coverage of a building being imploded. Charges are set from within then at a very precise moment a button is pushed; and in the amount of time it takes to exhale a single breath, what was once a valuable, strong edifice occupied with life and purpose and meaning becomes just a pile of lifeless useless dirty ugly rubble to be swept up and thrown away. In control? I was just trying to gasp for another breath. I was trying to force my heart to keep beating. Oh Lord! What do I do? Trust Me. Follow Me. I am in control. ​So, so many more times that conversation would be repeated. Each time with the same answer. Trust me. Follow me. I am in control. The friends and family departure. I am here child. The job loss. I will provide. The prodigal children. I will protect them. The broken hearts. I will heal you all. Every day, every time I reached out through the dust and the smoke He was there; each time leading me through the scriptures, each time giving me hope and reassurance. Trust me. Follow me. I am in control. Even in those times when I was impatient, when I tried to take control, when I wanted things to be resolved my way. Even when I didn’t trust, when I didn’t follow, when my actions only stirred up more dust and interfered with His work. Even then, or maybe especially then, God was there, He never left, He never stopped working. ​In the midst of the storm, God is working. He is healing. He is cleaning. He is protecting. He is loving. He is delivering. ​So many days all I could do was hide and weep. In public, in front of the kids, at the necessary times I could be strong, I could be determined, I could even be fierce. But in the quiet places, in the alone time with just God and my Bible, tears would flow and He would catch them. In control? I had long given up any notion that I was in control. But God continued to remind me that He was. Trust me. Follow me. I am in control. I will restore your family. And then slowly, heart by heart, one broken piece at a time, God began sifting through the pile of rubble that had at one time been our lives and hopes and dreams, and began piecing back together a family. Broken pieces of our hearts mended together with forgiveness and grace; creating lives that were more beautiful than before, rebuilding a family that became stronger than before. Oh friend, if you are in that moment or in that battle, know and believe that God is there too. He sees you. He loves you. And He is in control. 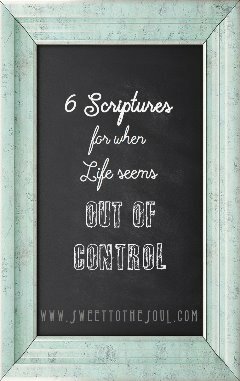 ​Life may seem out of your control, but nothing is outside of God's control. ​Today's blog is part of the series #LiveFreeThursday with author and Proverbs 31 speaker Suzanne Eller. Come see what everyone is saying about : out of my control. #CompelTip: I used a strong first sentence as a hook and sticky statements. 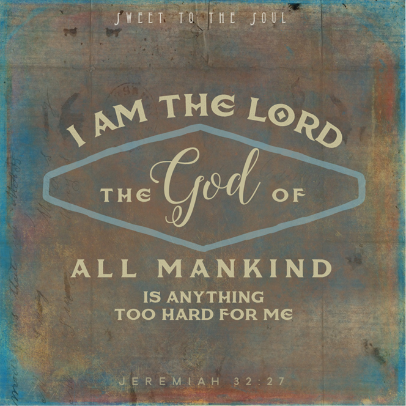 ​“'I know that you can do all things; no purpose of yours can be thwarted'"
"The LORD does whatever pleases him, in the heavens and on the earth, in the seas and all their depths"
"The LORD works out everything to its proper end—even the wicked for a day of disaster"
“'I am the LORD, the God of all mankind. Is anything too hard for me?'" "Nothing in all creation is hidden from God’s sight. Everything is uncovered and laid bare before the eyes of him to whom we must give account"
Thank you Michelle. We all find ourselves in the hard and messy at some point. I think it helps to hear that someone else was there also and they made it through. Jana, thank you for your vulnerability. Today there will be a woman whose family is imploding who will walk away with hope. I like these couple of sentences: "That uncontrolled moment that occurs in the middle of our big plan. That moment when we inhale from one world and exhale into another." Beautiful reminders today, Jana: "In the midst of the storm, God is working. He is healing. He is cleaning. He is protecting. He is loving. He is delivering." So blessed by your words! Jana, you quoted one of my favorite Bible verses: "Blessed is she who is she who believed that there would be a fulfillment of what had been spoken to her by the Lord." So much of our every day lives clouds the vision we know God has for us, but it's that stubborn belief in what He's promised that keeps us going forward. My life, my marriage, my family, my kids--all have been rubble. I have had so many implosion moments! But he's working it all together for good, isn't he? Very encouraging!! God will use your words as healing to others! Loved this. "But in the quiet places, in the alone time with just God and my Bible, tears would flow and He would catch them." What an intimate time with our Father! I'm so thankful that I am not in control, even though I sometimes act like I want to be. I know God is faithful and He walks with us through the hard times as well as the happy. He loves us so much. I found your post on the fb page for Women Leading Women. Your words are so encouraging and I appreciate your prayer at the end.